Recently I have working on a proper HDR with autoexposure, and adding a new shiny bloom effect. In process, improved quality of MSAA, and many other things. Now, finally, SE is able to display very large difference of brightmess, and true relative brightness of objects. Earth and Moon. Relative brightness must be adjusted for all Solar system bodies. More precisely, scripts will have a physical-based parameters for textures calibration. Something like MinPixelBright and MaxPixelBright in some physical units like luxes. 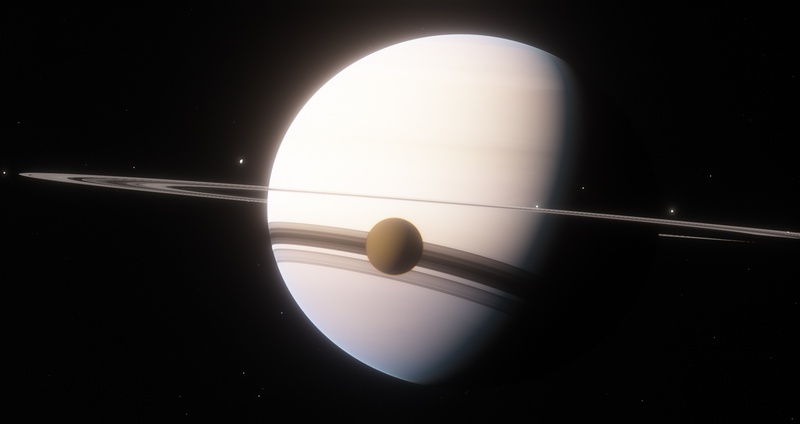 Saturn and Titan. No stars visible! Pluto and Charon. Stars are visible (although their brightness is still not calibrated, so this may be wrong). Saturn and Mimas with shiny glow. Earth’s night side. Atmosphere is glowing not in red color, as expected… I have to tweak the atmospheric scattering code. There is a tail of the comet Encke visible in top left (comets brightness is not calibrated yet). ISS over night side of the Earth. Starry sky, city lights, aurora, clouds and ISS are illuminated with a moonshine. I can use real photos from ISS to calibrate such scene. When ISS enters sunlight, it looks almost like explosion, until virtual “eye” adapts to a high brightness. Ship’s light in the “night”. Looks too shiny? Radiator’s glow is too bright and too hot, it must be separated in its own texture, controlled by the graphics engine. Engine exhaust looks extremely bright, because its brightness is calibrated for the the next picture. In the “day”, engine exhaust is barely visible. This is why its brighness was so extreme. Radiators glow and lights are completely invisible. Molten planets looks interesting in the Solar system browser. Glowing lava now looks really “glowing” (that is a planet in the sky, but it is so bright compared to the night moon’s surface, so it is being overexposed). “Interstellar-style” black hole looks much better with a new bloom. With HDR, it is now easy to explore extremely bright object such as stars and accretion disks. Autoexposure speed is a bit too slow in this case (and adaptation back to starry sky), I have to derive a better formula.